Last week, my Twitter friend Morgan Guyton wrote a provocatively titled post, Is damnation of the other a cornerstone of evangelical belief?, with a provocative hypothesis in regards to Larycia Hawkins firing by the private Christian college in Illinois, Wheaton. I think he is right. I think there is also a bigger issue going on, centered set vs. bounded set theology, a concept I wrestled with a couple years ago here on the blog. Dave Schmelzer of Blue Ocean Faith has developed this concept very well for me. I think it influenced me deeply in my commitment to open handed faith. I was reminded of this and made the connection to Prof. Hawkins situation with Wheaton while listening to the podcast of the Unquiet Life. 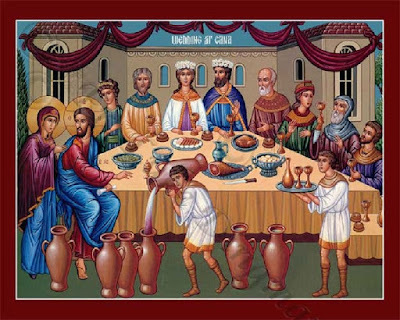 In this morning's reading from the Book of Common Prayer, in John 2, Jesus, his posse, and his mother, Mary, are at a wedding when the wine runs out. Mary immediately turns to Jesus, bringing this crisis to his attention. Now this conversation is highly stylized. St. John is making a much bigger point than Jesus is capable of bringing the party or that Jesus is pro-alcohol. One thing St. John is doing is showing Mary's expectation for Jesus to do something, and it was not a package store run she had in mind, as his answer is also highly stylized, "My time is not yet come." Mary apparently disagrees because she tells the house slaves to follow Jesus' instructions. Six large stone jars are noted, much bigger than beer keg size. Jesus tells the slaves to fill these empty jars to the brim with water.